It’s one of the most famous shrines in Japan, and for anyone who has seen the movie “Memoirs of a Geisha,” it’s a must see on their list when visiting Japan. 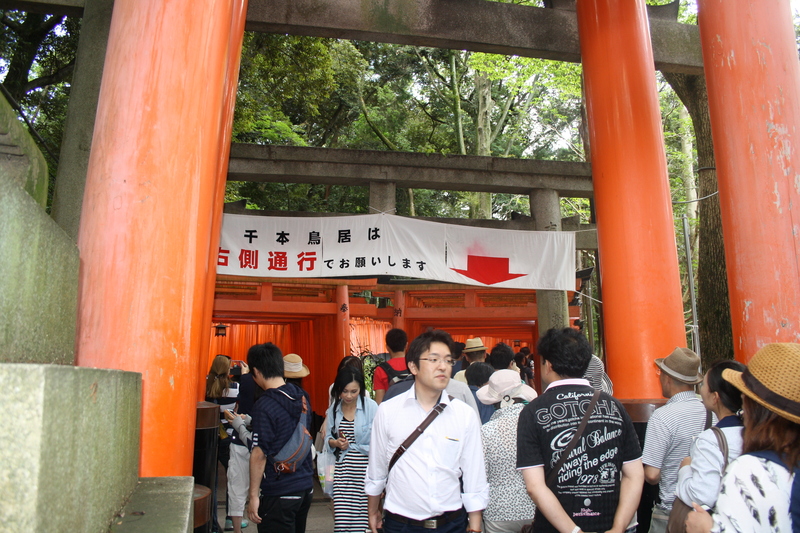 I’m speaking of course of the Fushimi Inari Shrine and its trails to the top of the sacred Mt. Inari. 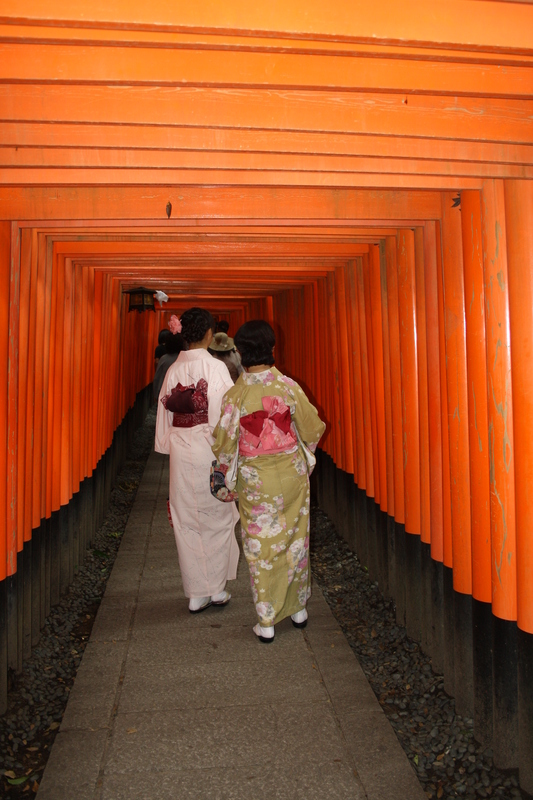 Commonly referred to as the “Thousand Gate Shrine,” it literally has thousands of torii gates that visitors walk through up and down its numerous paths. Next to the Golden Pavilion, it is arguably the most popular physical attraction in Kyoto for photography. Waking up on that Sunday morning, we had to check out of our hotel. Our first full week in Japan was officially over. We heard that there was a concierge luggage transportation service that would take our bags from our hotel (the Westin Miyako) to Kyoto’s central train station where the hotel had a special holding location for guests. The downside was that you had to collect your luggage by 6:00 p.m. that same day or they’d be kept overnight. While I would have preferred more time, I knew that getting the bags much later than 6:00 p.m. would just mean we’d show up at our next hotel in Nagoya really late, which could be a dangerous situation with a 2 year old tantrum. Once we got the bags squared away, we hopped on the shuttle to the train station to get our connecting train out to Inari. The commute time to Inari from central Kyoto was not that long, about 10-15 minutes by train. Once you cross the tracks and start the walk through the street towards the shrine, you are immediately surrounded by cute shops and street food vendors selling Japanese souvenirs and sweet and savory treats. It’s a little bit kitschy but fun. The crowds seemed a bit light for a Sunday but still very busy. I attributed the manageability of crowds to the fact that we were visiting during the rainy month, though we only had very brief and sparse sprinkles that day. 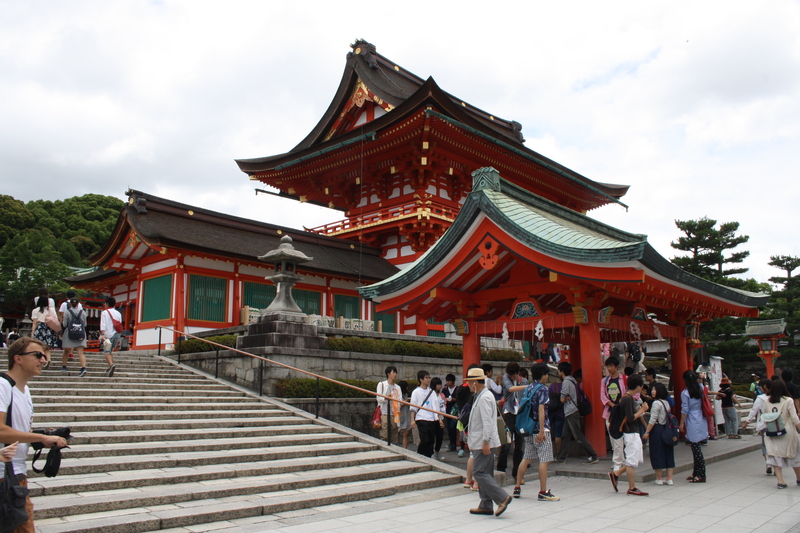 There were some wide and manageable stairs to get up to some of the religious buildings and the main shrine but were manageable with a stroller. While walking around with the kids, we drew a lot of attention since I chose to put them in their number shirts. A group of Japanese students even asked to take their picture with us! Walking from the train station to the main shrines and temple. Inari. Be cautious when photographing around this part and look for any “no photography” signs as there are certain areas closest to the temple where photography is prohibited out of respect for the sacredness of the area and ceremonies preformed. Once we walked around the main buildings we started towards the path up the mountain. My husband really wanted to go all the way to the top. 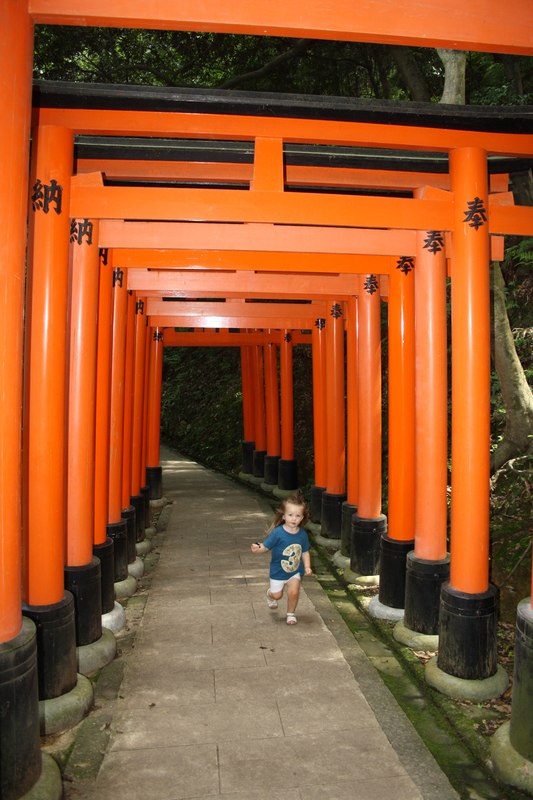 But first, he just wanted the “Memoirs of a Geisha” running through the torii gates shot! We came to the two paths where naturally most people were walking up on the right and people were coming down on the left. The start to the top of the mountain essentially began here and the right side of the tunnel had the constant stream of tourist starting their assent. To get a good picture, try stepping up into the left side path that has a much slower stream of people coming down so you can get a better chance at a picture with just your party. Go up the path on the right, but first duck into the left hand path of the downward travelers to get a less crowded picture. There were a couple times in between each stretch of the gated paths where you had to make a choice of direction, I found it slightly confusing to follow to get to the top, despite there being some maps. It doesn’t always play out the same way on the path as it does on the map. But we made our way up and up. We didn’t make it far before we decided to stash the stroller on the side of one of the rest areas since we were met with many stairs for the foreseeable future. We figured that it wouldn’t get stolen, but there wasn’t much choice. 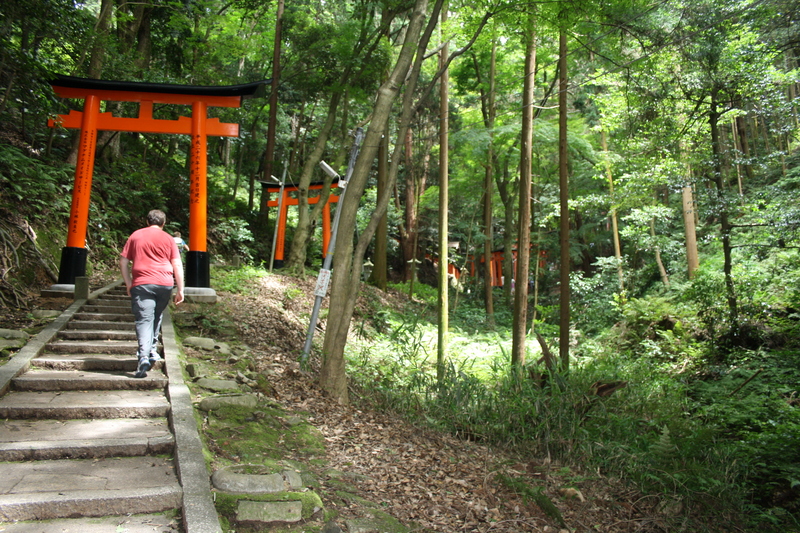 For the first hour of our time there, it was beautiful and fascinating to see so many of the torii gates and the landscape of the mountain. Half way up we got a beautiful view of all of Kyoto below. The kids and I were very tired at this point. We had been climbing stairs for about an hour. I wanted to turn around and since I had already gotten so many wonderful photos, I felt I was good. But, we promised my husband we’d make it to the top. The only thing that kept me going was that the ½ way up view was so gorgeous I kept imagining how much better the view would be once we got to the top. 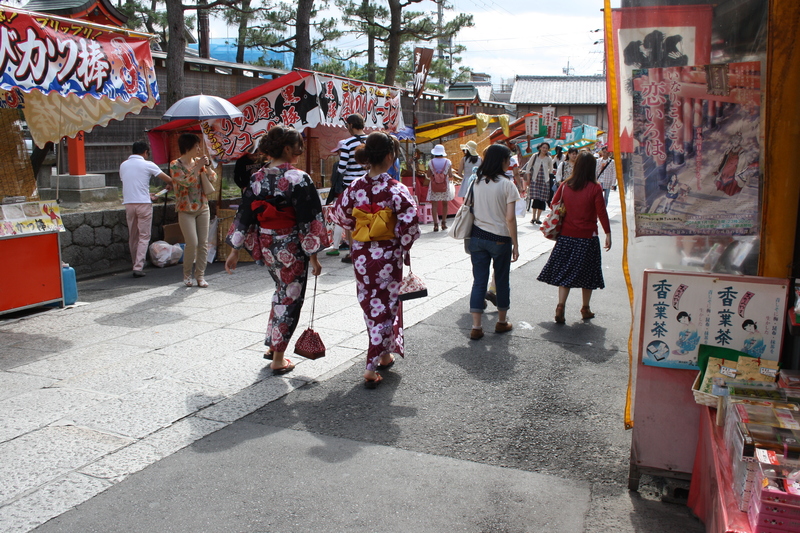 We found several Japanese tourist who wore traditional kimonos and shoes to make the pilgrimage to the top. 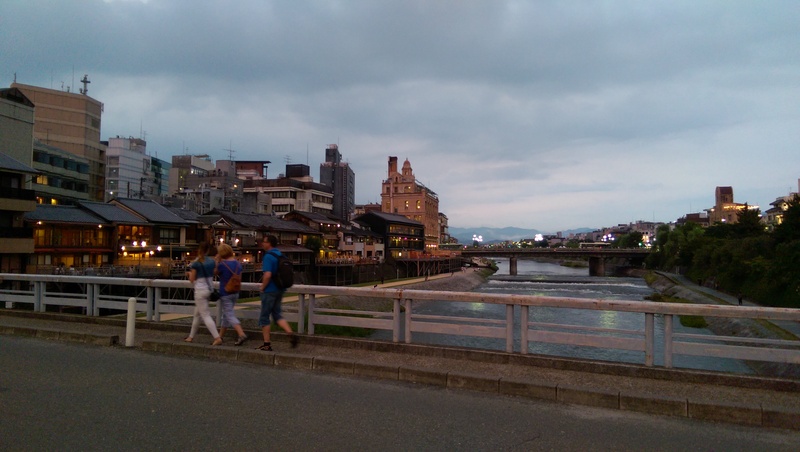 The half way point view of greater Kyoto. The boys were being troupers but even their patience was running thin. My 2 year old was the hardest as I didn’t have the Ergo with me so we went back and forth with her walking, them me carrying her, then my husband. We had to bribe them with Oreos that I purchased at one of the stands. Finally, after two hours from our arrival at the shrine, we reached the top. I was SO relieved because about 5 minutes before we got to the top, my 5 year old announce that he had to go to the bathroom, and not the stand and pee on a tree kind! Bribing the kids with Oreos at each rest station to keep going up the mountain. As I looked up from catching my breath from the last set of stairs, my heart sank. 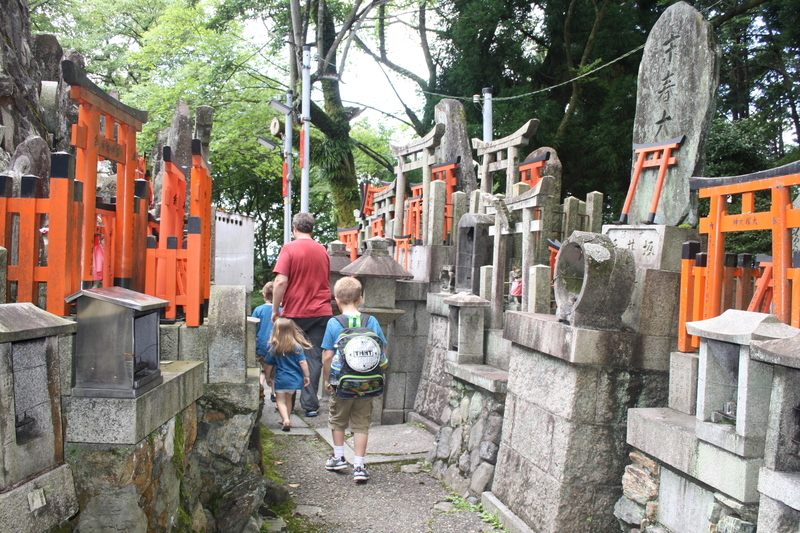 We were completely surrounded by trees and in the middle of the path was this two tiered, stone landing area with a bunch of little stone shrines all around it and a gated one in the middle. I read a sign that said “Top of the mountain.” I looked around waiting for the amazing view, searching with my eyes for something exciting, some other little path that I had missed that would lead us to the site that would make 12,000 steps worth it. Nothing. Nothing but the increased pleads of my son for a bathroom. I tried to distract him while my husband took a quick look around at the thing he was so committed to seeing, then he took my son back down the trail to look for a bathroom. There were little restaurants, little souvenir stands and resting landings ever so often on the way up and we hoped that the last one we saw before the top would have a bathroom. While they started down, I took my turn to look around. It took all of 5 minutes before I saw all that I wanted to see and I started back down with my 7 year old and 2 year old. The top of the mountain and no view of the surrounding area below! Seeing all that there was to see of the shrine at the top of Mt. Inari. When we reached the first landing station on the way down we looked around to see if it had the bathrooms. Seeing none, we asked a man there and he said “no, the next, just 5 minutes walk.” So, on we went until we came to the next stop. Seeing nothing again, we asked. “Not here, just 5 minutes that way” as he continued to point down the stairs. We went some more and finally by the 3rd landing we saw the bathrooms, but not my husband and son. Continuing on the trail we finally caught up with them and we all lamented at how disappointing the top of the mountain was and how many times we had to walk “just 5 minutes” to get to the bathroom. When we reached the base of the main shrine and temple, my husband looked at his Fitbit and said we had climbed 12,000 stairs! We finished up the trip with some food from the street venders and a little souvenir shopping on the way back to the train. Since we didn’t get back to the Inari station till close to 3:00 p.m. we knew we didn’t have much time before we had to pick up the luggage from the central station. After some debate, we decided to try to go walk around the Imperial Palace grounds. We found a wonderful playground that was a nice treat for the kids before we had to call it a day and get back on the train. We were Nagoya bound, about an hour and a half on the bullet train from Kyoto, and there we would spend the next 5 nights of our journey in Japan. We woke up to rain, for the first time since arriving in Japan. I knew full well that June was the rainy season for Japan, but we had been incredibly blessed with really nice, rain free, weather up to this point. My plan had been to take the kids to Nara this day, so they could wander around Nara Park petting and feeding the free roaming deer. That just didn’t sound very fun in the rain. I checked the surrounding areas and all had rain in the forecast. So, we needed a new game plan. 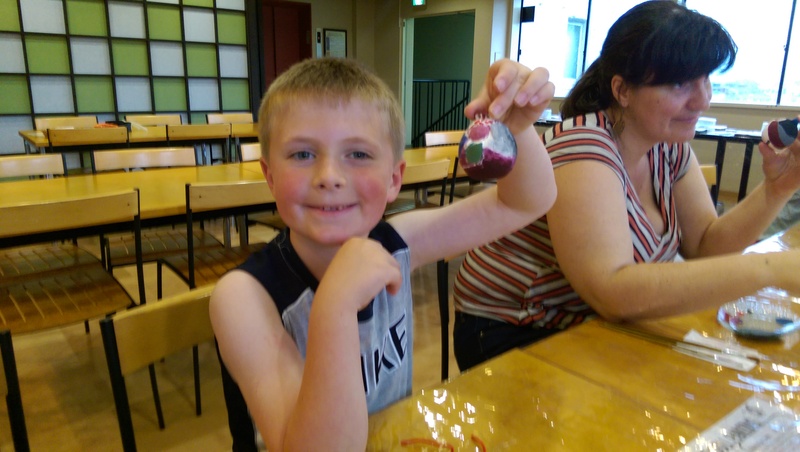 I still wanted to take the kids to the Japanese performing arts show, and with only a couple more days left at our Kyoto hotel, it only made sense that we do something local. But, we were still saving the main attractions to do with my husband on the weekend. Since we would be somewhat limited in our adventures today, I pulled out some clothes from the dirty clothes pile and decided to do a load of wash in the bathtub. 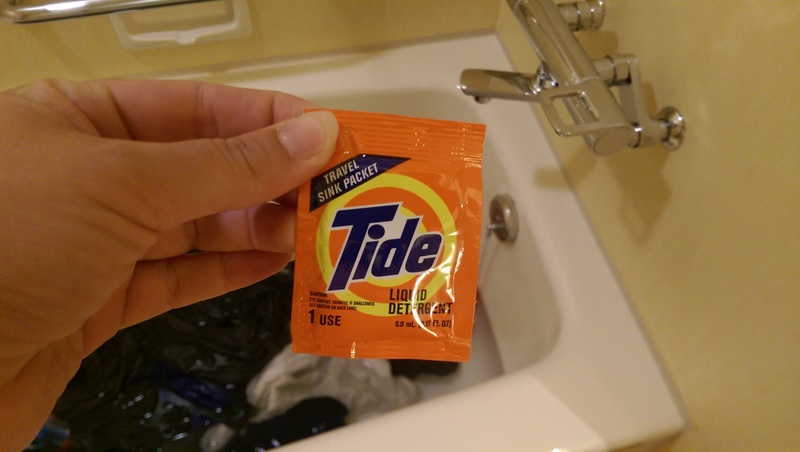 I had packed 3 packets of sink size Tide detergent travel packs so that we could do wash during the trip. I picked out a couple pieces that I knew would dry quickly and a few that I knew would take a full 24 hours to dry. Then I dumped them all in the tub. Twenty minutes later I had some clean tops, shorts and underwear for all 5 of us hanging up to dry around the bathroom. Then, we headed off to breakfast. At breakfast, a little late in the morning, I mulled over our entertainment options for the day. 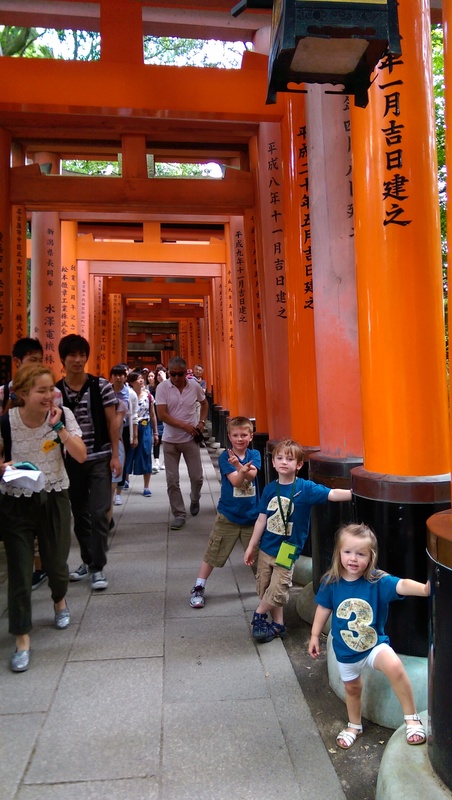 I decided to check with the concierge about a few experiences I had hoped to have for the kids that were special to Japan. I wanted them to get the chance to do Karaoke and I wanted them to be able to do some kind of Japanese craft. I was not disappointed with the choices. The concierge pointed out the Kyoto Handicraft Center and the location of a Karaoke club where you can book private rooms to sing within your own party. While the kids didn’t baulk at the ideas, they had one more of their own. They wanted to go swimming again! With the rain pouring down outside, how could I say no. I figured there was plenty of time in the day to swim for a bit and then go out and do the activities I had found. The funny thing about the swimming pool at the hotel, and this could be true for all Japanese swimming pools, is that you have to wear a swim cap. At first I thought it was just because your hair could be dirty and they want to keep it from making the water oily or something. But they are mesh hats, given to us to use by the hotel since we didn’t have our own caps. So it’s not like a full barrier anyways. Nonetheless, we wore them and I have to admit, the kids looked pretty cute with them on! 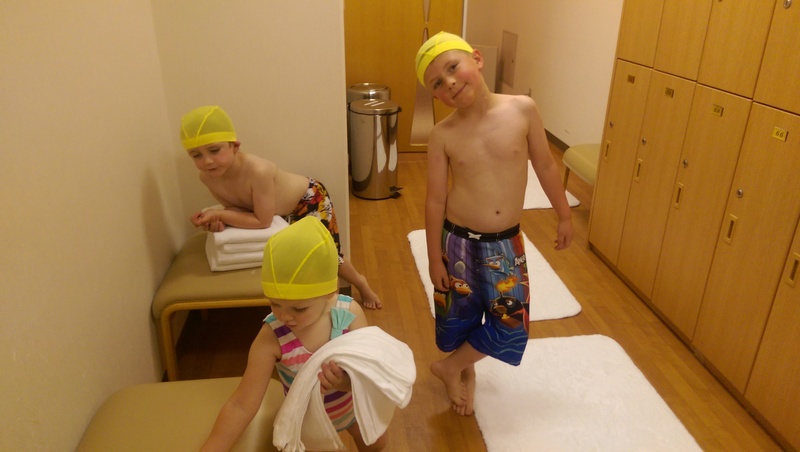 After some fun in the pool, we went back to the room to change into clothes to brave the weather. Swim caps required for the hotel pool! At this point, I started remembering all of the things I forgot to bring to battle the rain. I had a plastic poncho from Disneyland Paris still sitting in my closet at home and my stroller rain cover still in the back of my car. Both of which would have made our day much less miserable. But the idea of staying in a hotel room all day sounded about as much fun as trying to take all 3 kids to the dentist by myself. So we put on some of our athletic clothes, the ones that tend to pull away moisture and dry easier, our sandals, and rain jackets, then headed out the door with the one umbrella that I had packed. The rain wasn’t mild, but it wasn’t stormy. In fact, it was a typical Seattle down pour. The handicraft center we were going to looked to be about a mile and a half way. It was just past the Haien temple that we had walked to a couple days prior. I convinced the boys that this was do-able and not much further than they had already walked before. I must admit, I was a little nervous at how well this walk in the rain was going to go, and not so much over how the kids would handle the rain, but how I would handle the rain! But we all marched along our route until we hit our landmark 7-11 store. Given that it was past lunchtime by time we started our walk, we stopped in for some corn dogs that made for a quick lunch. We’ve been getting a pretty big and hardy breakfast each morning at the hotel so I don’t mind making lunch a bit smaller and am flexible in what they choose. After the corn dogs, we continued our walk and ended up having to navigate some confusing side walk and street construction around the area we should have had a direct path to for the handicraft center. 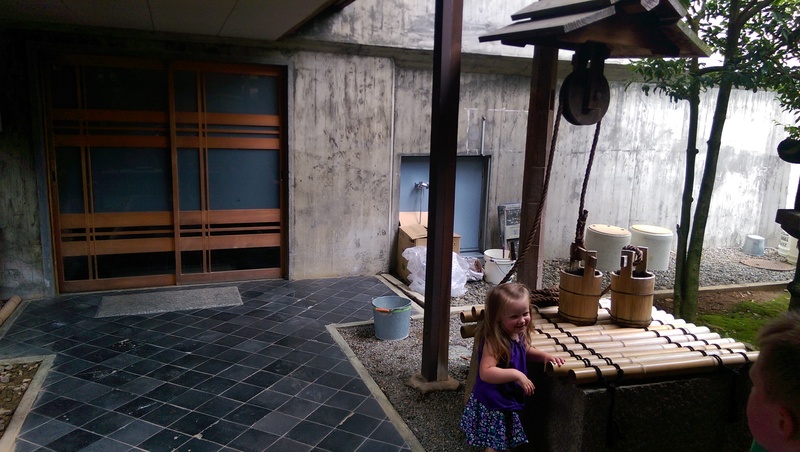 Because of that, we happened upon a building that I originally thought was still part of the temple grounds, since it was constructed in the more traditional Japanese style. I saw a few people standing about and decided to check if anyone knew how close we were to our destination. The woman we approached pointed us in the direction that we had been on and said it was very very near. I took the opportunity to also ask what was going on inside the building in front of us that had multiple pairs of shoes lined up outside. She told me that there was a class practicing Aikido martial arts. The large square building had the sliding doors open on all sides so we walked along the path to watch briefly from outside. Since both of my boys are doing Taekwondo, it was interesting for them to watch a different martial arts form practiced in one of the disciple’s native countries. Not wanting to be a distraction, we stayed just 5 minutes then went back to our path to the handicraft center. Watching a Japanese Aikido lesson. By time we got to the Kyoto Handicraft Center, it was 2:45 p.m. I went in and inquired about the crafts that kids were allowed to do. They showed me a board with the times but said that you had to make a reservation, and that they were not sure if there were any spots left. My heart sank, I didn’t even think about having the concierge call ahead. But, they said I could check next door in their other building to see if there was still space. So over we went. They had one in progress that started at 2:30 p.m. and the next was schedule for 3:30 p.m. While they said that we could still join in at the 2:30 p.m. one, I liked the craft that they were doing at 3:30, so we waited. The rest of the center was a huge shop selling various things that are made in Japan and then some Japanese souvenirs (that were probably made in China). So I picked up a souvenir and some postcards while waiting. From reading the description for the center in the hotel’s map of Kyoto and recommended things to do, it sounded like the craft was going to be free. So I was a little surprised when at 3:30 they asked for the fee before we went up. 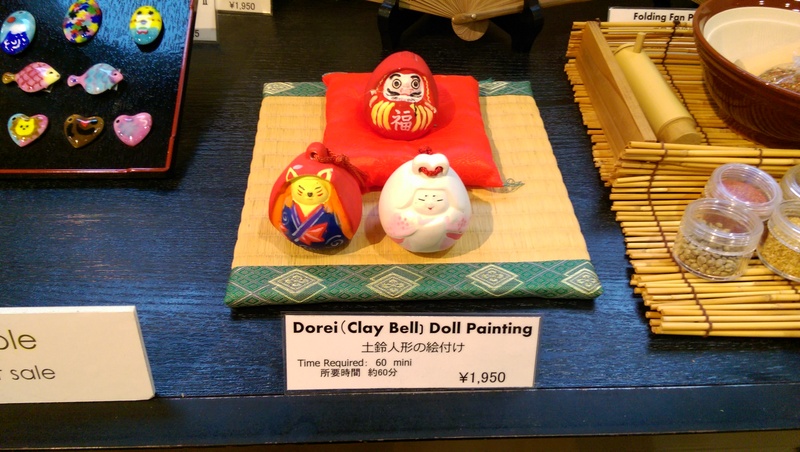 Already committed in my mind to do it, we paid the 1900 yen per person (I just did 3, one for each kid) to do the painted doll (that was actually a bell) craft. They led us over to the other building and up the elevator, to the room, and got us all set up with our paints. My 2 year old, who had been asleep up to this point, seemed to wake just at the right time when she heard the word paint, and activity she loves. There was a beautiful display of the finished product examples on the table to give us an idea of what to do. Doll bells at the craft sample table. Kyoto Handicraft Center. And this is how ours turned out. 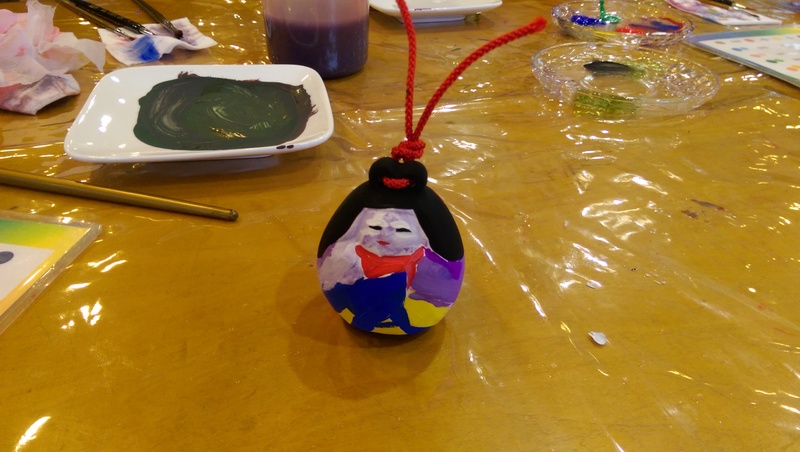 I tried to let my perfectionist ideals go, and let the kids be kids and paint their bells how they wanted to. I struggled with my 2 year old, because in my mind, I wanted something to somewhat resemble the samples. So we compromised, I let her paint what she wanted and then I tried to make it look like a person with hair and a face. Our Japanese bell doll that my 2 year old and I created. While we had been painting, my husband texted me that he had a break from work for a few hours and said he could join us. By time we were done, he had walked over to the center to meet us. While the craft finished, we could also watch some of the artisans working on Damascene with find nails, little hammers and gold patterns. Our plan was to go to the Karaoke club next. My husband walked with us to where I had seen the closest subway station on the map, which looked like a straight shot and not that far away. But alas, it took a good 20 minutes to get there, still in the rain. At this point, he was sweaty and soaked, despite his jacket, and would need to go back to the hotel early to change for his business dinner. So he got off the subway before us and we parted ways. It was now 5:00 p.m. and I wanted to be sure we didn’t miss the show again. I decided to try for the 6:00 p.m. show (there was also a 7:00 p.m one too) to ensure we made it and then try Karaoke after. I knew in my mind that I needed to get some cash. But with my preoccupation at finding the theater with the 3 kids in the now stormy pouring rain, I completely forgot to look for an ATM and get cash. We got to the theater with our outer layers dripping wet and relieved to be inside again. Up at the ticket counter I saw the sign “Cash Only.” Crap. Because I forgot to stop, I didn’t have enough to buy the tickets. I asked where the closest ATM was and they gave me a neighborhood map that showed the closest 7-11, which is the most common place for ATMs apparently. Unfortunately for us, it was practically back at the subway station we just came from. 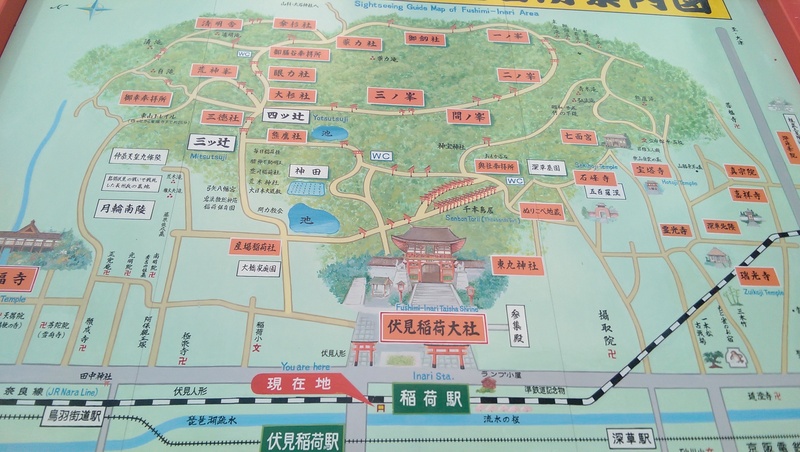 But, at least I found a new route that led us through a beautiful temple complex. At the 7-11, I got enough cash for the next week and had the kids pick out dinner. Since we weren’t going to make the 6:00 p.m. show and would instead have to do the 7 o’clock one, I gave up on Karaoke for the night, which was where we were going to order food at for dinner. 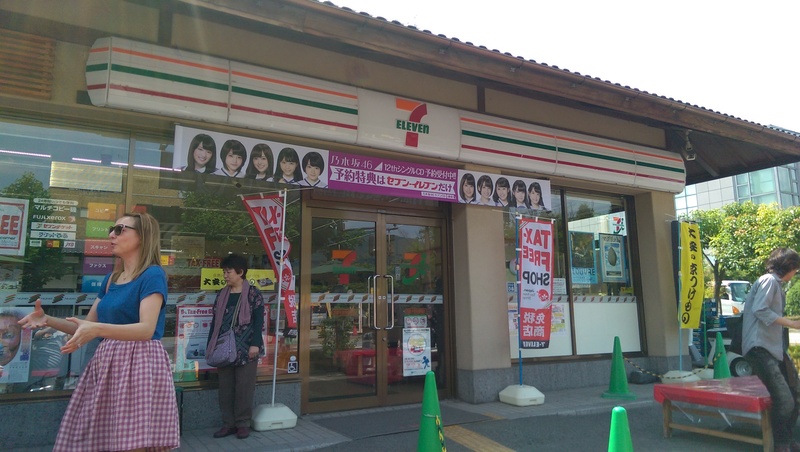 This 7-11 was tiny compared to the one from earlier in the day and had no place for us to stand outside to eat. Cultural custom is that you don’t walk around while eating and I was trying as best I could not to be the rude American. So we set out in search of some kind of covered area where we could stop and eat in our route back to the theater. No such luck until we came back to the temple, where there was a covered pathway between two buildings. It being 6:30 p.m. and in the rain, people weren’t exactly swarming this complex. I decided we needed to stop somewhere with shelter and let the kids eat. We stood in the covered area and ate as quickly as we could before heading back at the theater. Trying to find shelter in the rain. Finally back at the theater, we waited in line for the 7:00 p.m. tickets, again, thankful to be inside again. Seating was quick and easy and so was putting aside the stroller. The theater was not very big and we got a place near the center in the 4th row. 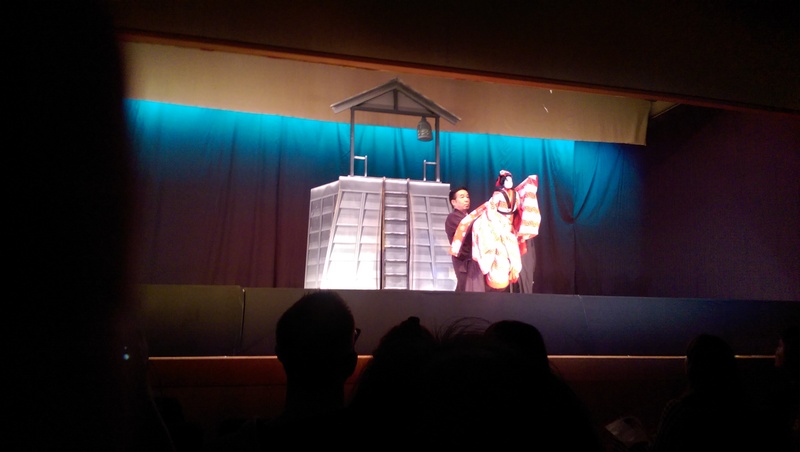 The program included several forms of Japanese performing arts. 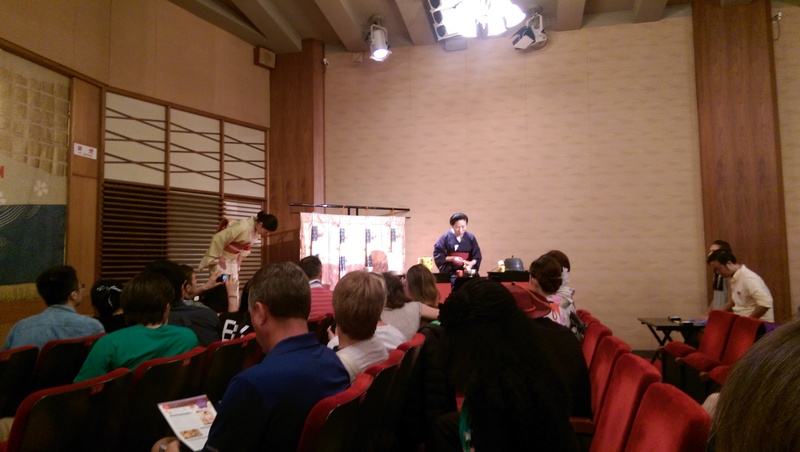 It began with a tea ceremony (Chado), in which two guest participants were selected. 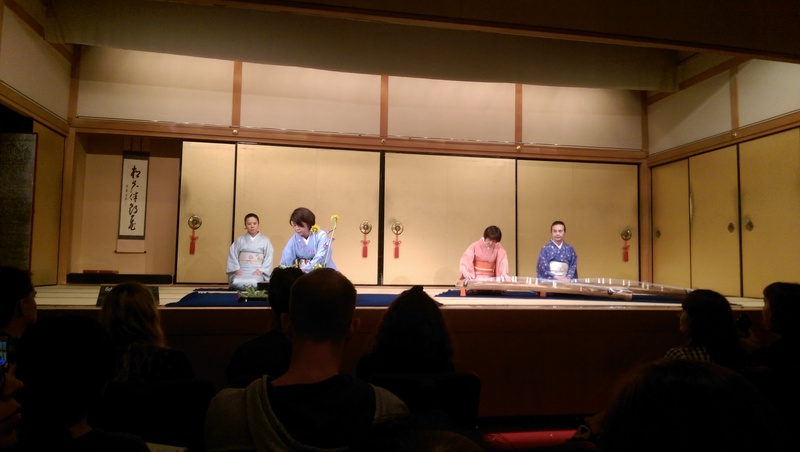 During the tea ceremony, two musicians began playing the Japanese harp (Koto). While they were playing, and while the tea ceremony was still in process, the flower arrangement (Kado) demonstration began. All three ended around the same time. I was really glad of this format as it gave the children something in two different spots to look between, which kept them quiet and captivated. Japanese Tea Ceremony at Gion Corner. Japanese harp and a flower arrangement demonstration. Gion Corner. Next came some of the more lively performances. My 2 year old was particularly fascinated with the court music (Gagaku) and dragon dance. My 2 year old being fascinated by the court musicians and dragon dance. Court musicians and the dragon dancing. 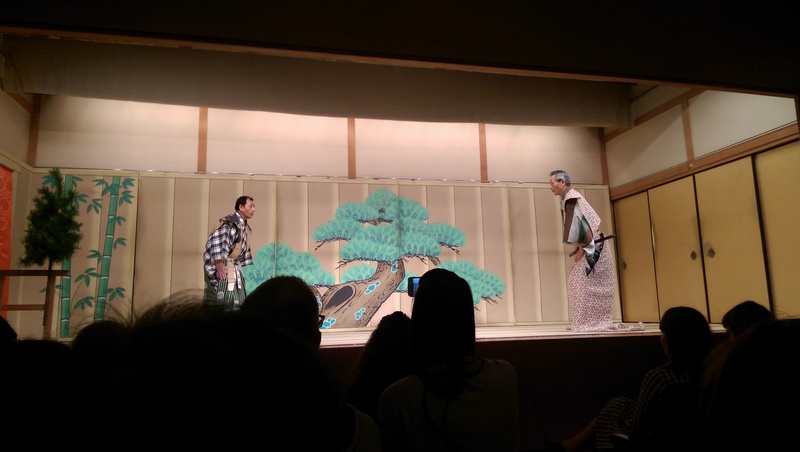 The ancient comic play (Kyogen) came next. While there were some English explanations made over the speakers and written in the program, it wasn’t clear enough for the kids to understand. Nor was there enough time for me to read it to the kids in advance of the performance. So they were a bit confused by the comic play. Ancient comic play. Gion Corner. The main attraction, was 2nd to last and was an actual Maiko (a young Geisha) who performed two Kyoto style dances (Kyomai). 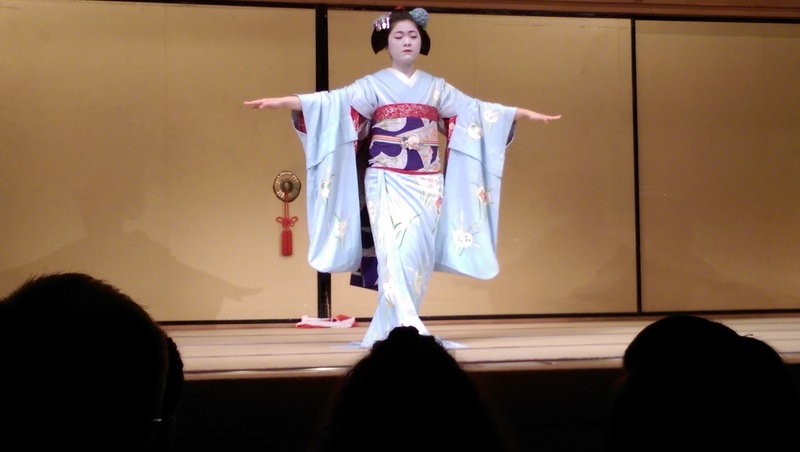 A Maiko dancing. Gion Corner. Last was the puppet play (Bunrake) which I thought the kids would enjoy the most, but again, we didn’t have time to get the full story beforehand, so they were a bit confused. I think my 5 year old even called it “creepy” haha! But from an adult perspective, it was fascinating how fluid they made the puppet move. For most cases, it took 3 puppeteers to manipulate the one puppet. The whole show was an hour total. It was the perfect experience for the kids. 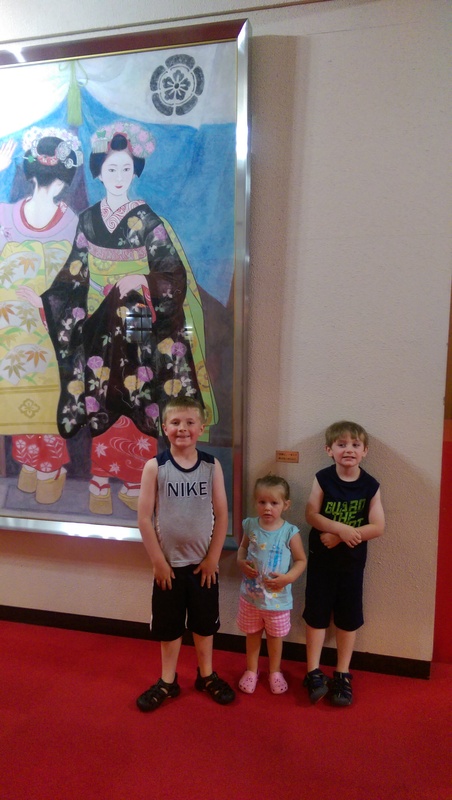 They got to see all of the traditional Japanese performances I hoped to expose them too and it was in a very manageable time frame to keep their attention. 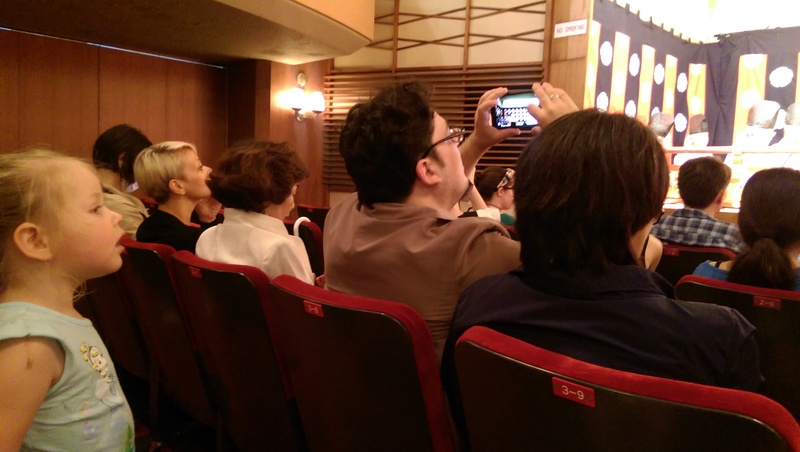 The theater where we saw the performance was Gion Corner. It is very much a company that created this program especially for tourists. But in my opinion, it was well worth it. Again, my 5 year old and 2 year old were free (and they still got their own seats). I had a discount ticket flyer from our hotel so my ticket was only 2800 yen (around $25 with current exchange rate) as opposed to the normal 31500. 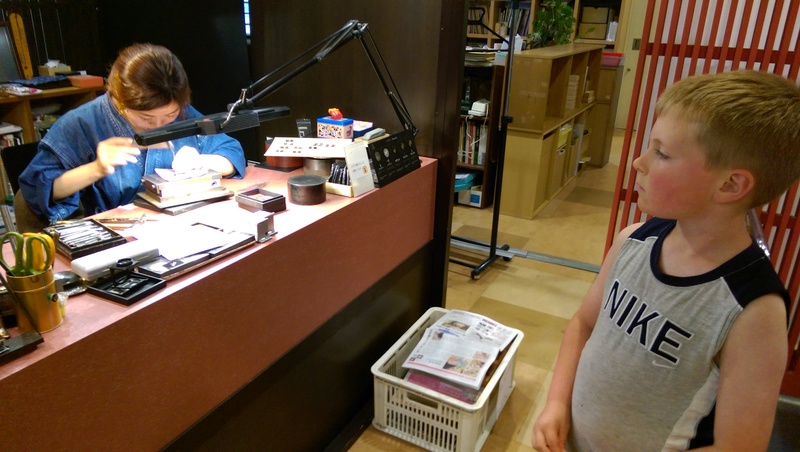 And my 7 year old was just 1900 yen. 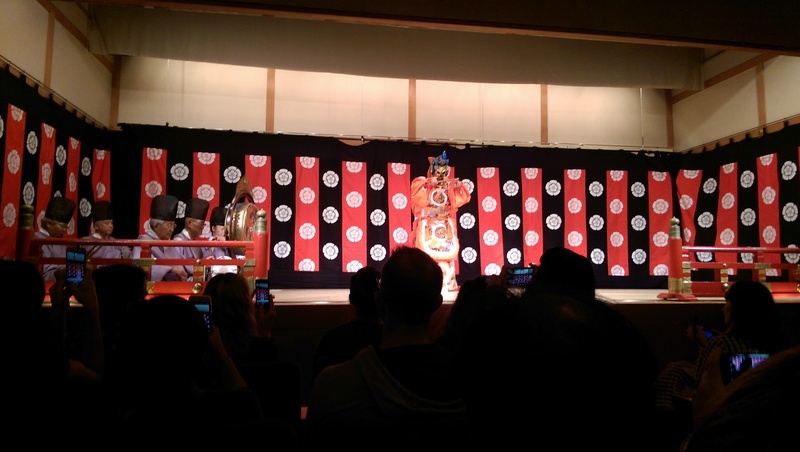 We had a great time at the Gion Corner performance! By time we were out of the theater, the rain had lightened up quite a bit, so it was a reasonable walk back in the direction of the hotel. I had a rough idea of where we were going, and after 20 minutes of walking, we ended up at the subway station that was on the same line for the stop I had read was next to our hotel. I was so happy to have finally figured out where the subway stop was, turns out it was on the opposite side of our hotel from where we had walked on previous days. This was handy information for Day 6, coming soon! Himeji Castle was one of my “musts” for this trip. 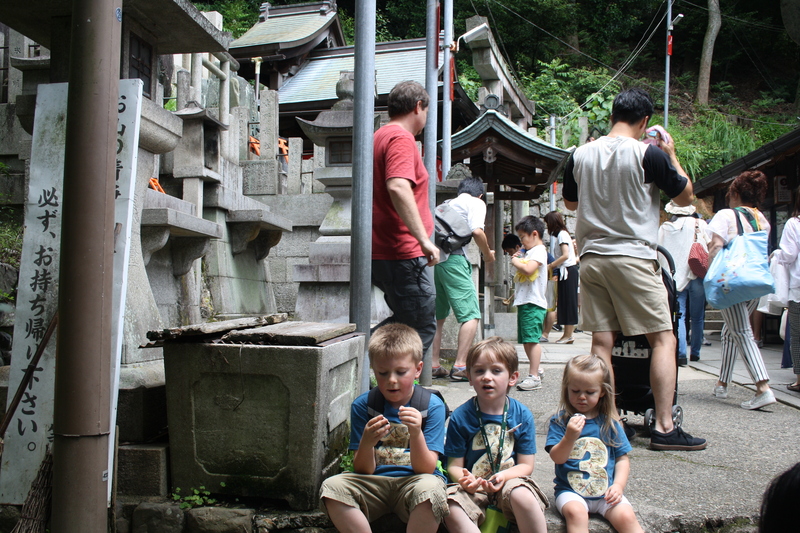 It also was one of the places we learned about in our Little Passports Japan kit, so I really wanted my kids to see the real thing. Himeji was also a straight shot from Kyoto with our JR pass. 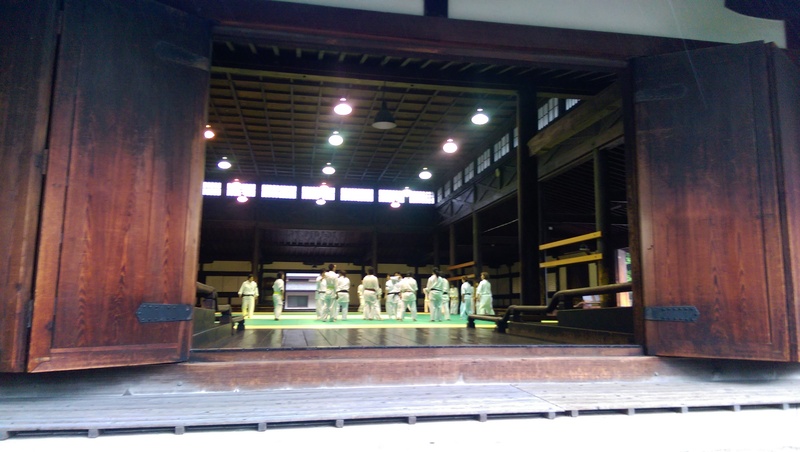 I had just planned to go and visit the castle then come back to Kyoto in order to attend a show of traditional Japanese performance arts. After such a long day in Osaka the day before, I figured another low key day was in order. At least that is what I thought. 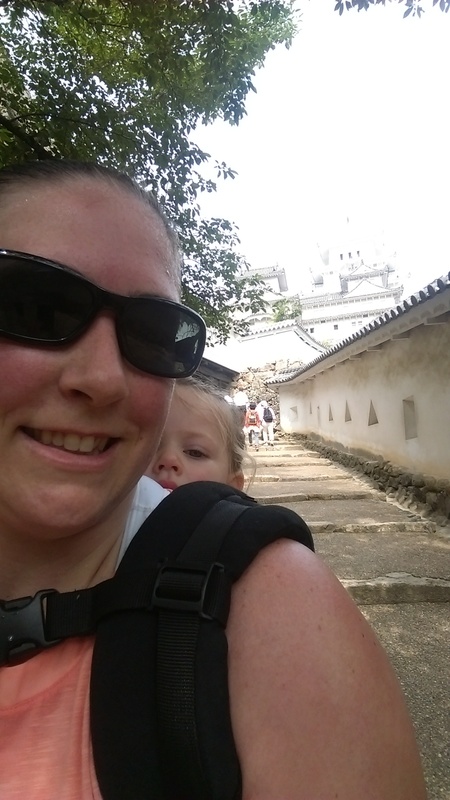 Given that I only planned to visit Himeji, we took our time getting out the door. We took the shuttle to the train station and made an easy stop at the JR ticket office for our bullet train to Himeji. It was going to take about 45-50 minutes to get there. My daughter fell asleep before we got on the train and I employed reason 497 of “Why I love my Baby Jogger City Select stroller.” Since I had to fold it up and put it behind the seats, I just popped off the seat and laid it on the floor with my daughter in it so she could keep sleeping with no blocking of the aisle. 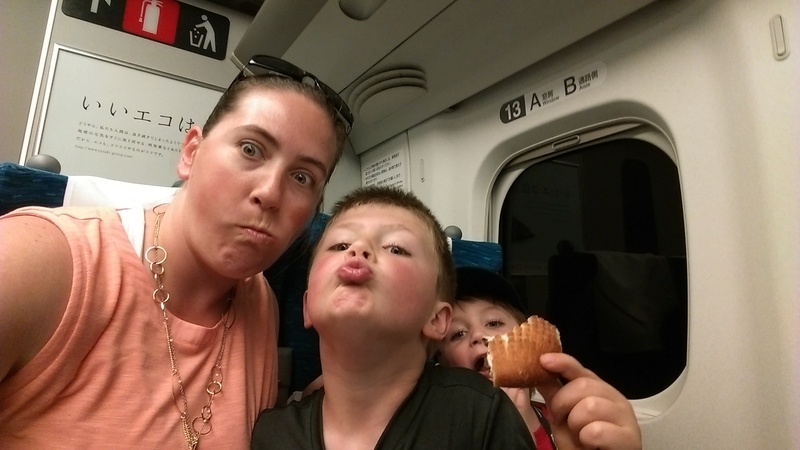 That left just me and the boys to have a little snack and be silly on the train until we arrived. Nap time on the train in her stroller seat. Just having some fun on the train. Once we were at the main JR train station in Himeji, it was really easy to find the way out and to see which direction the castle was in, being how you could see it the moment you walked out the train station! So we started looking about and saw the buses. Even though you could see the castle, it was still pretty far. Japanese cities are like Paris, something looks like it is close, but really it’s 20-30 minutes away by foot. We inquired in at a local tourist information center who said to take the castle loop bus around the corner. So off we went, but we found that we had just missed it and it ran only every half hour. Walking it was, and boy I was not disappointed. Before we even got half way to the castle (which is a straight shot down the same street, directly out from the front of the train station) I was falling in love with this city. The side walks were large and wide with very separate lanes for bikes, walkers and had greenery and lovely art statues every so often. Little allies that were actually large and long shopping arcades shot off in all directions of the street. I felt so comfortable to be walking along this street, despite the completely foreign language. 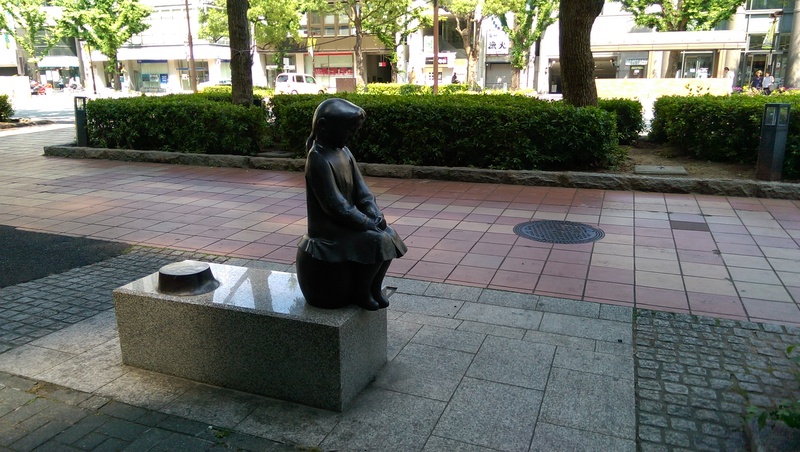 One of many statues that line the street from Himeji station to the castle. 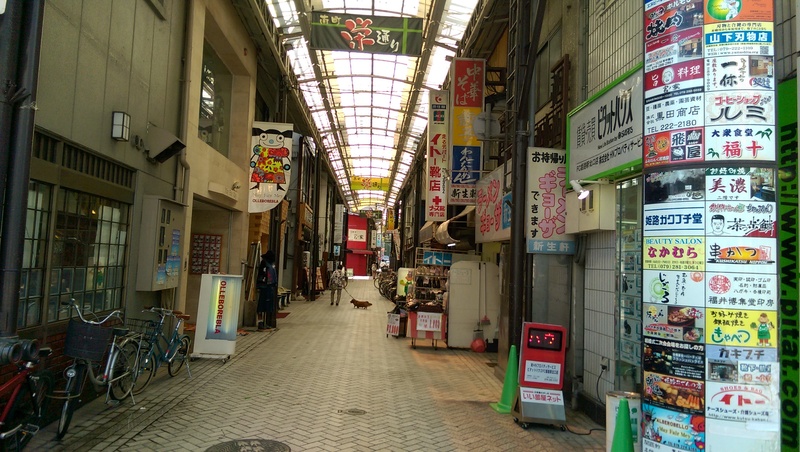 Shopping Arcades off the main road to Himeji Castle. As we approached the castle and picked up a brochure and map from the information center, I began to wish we had gotten an earlier start. We probably wouldn’t have enough time to visit the zoo in addition to the castle. It turns out Himeji is a place you should spend a couple days! But alas, we had one, and less than that too. It was time to get up to that castle and see what was in side this colossus. I was really glad that I brought the Ergo this time! Walking up to the main keep of the Castle. It was above 85 degrees F that day! 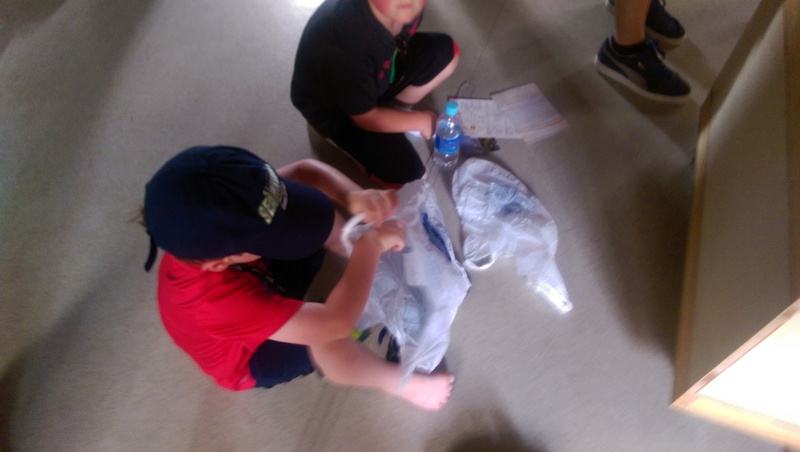 To go into the main part of the castle, you had to take your shoes off and put them in the plastic bag that was provided for you. What was not provided, slippers or socks. So if you were wearing sandals, like the kids and I were, you walked barefoot if you wanted to see the castle. Just a heads up, when you visit, perhaps you’ll want to wear tennis shoes with socks. Taking shoes off to go inside the castle. There was nothing inside the castle except the incredibly steep stairs that were practically ladders. 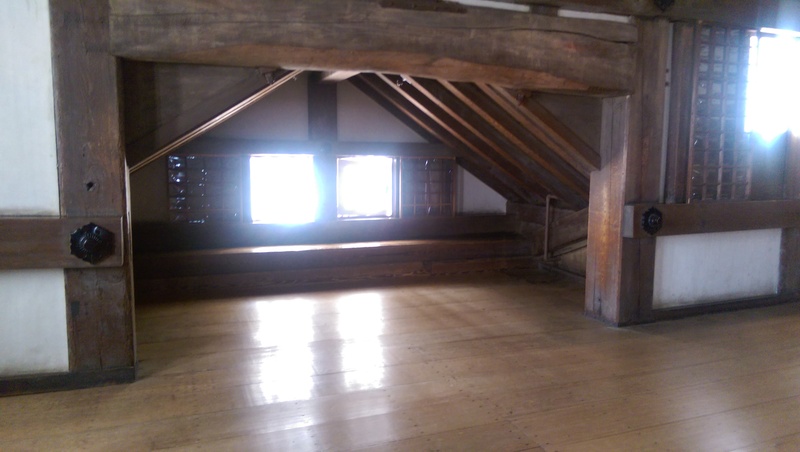 You could see however the incredible wood build and design of the castle, Japan’s only major castle that has never been damage in a war. 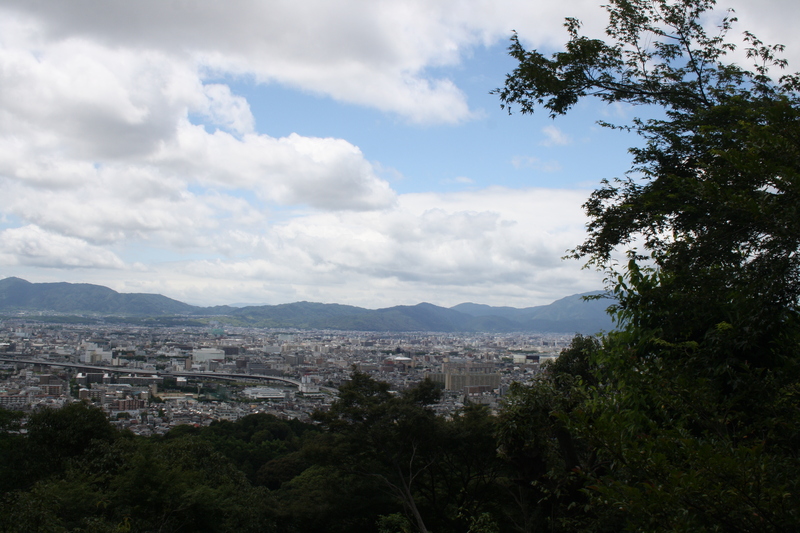 There was a great view of the grounds and Himeji from the top however. In all, it was a very beautiful sight to behold. It lives up to it’s nickname “The White Heron” which is a symbol for the whole city and often manhole covers are adorned with a flock of flying white Herons. 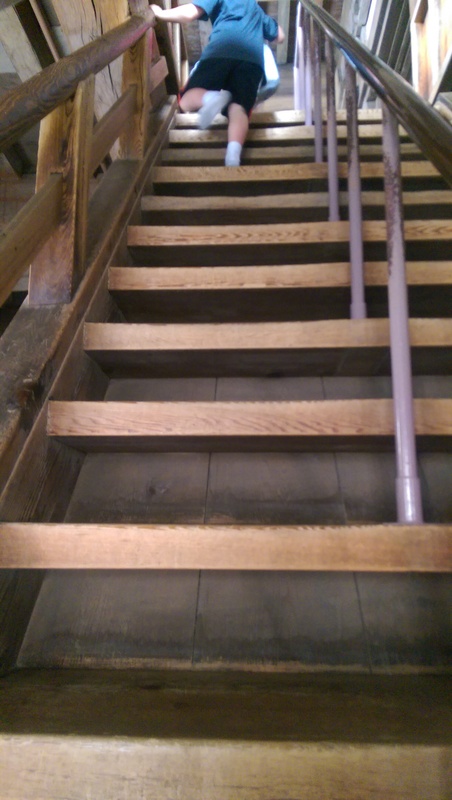 Six floors of these steep steps up and down. I was having such a nice time walking around the castle grounds and had seen many things on the road there that I wanted to go back to, I lost my sense of urgency to get back for the show in Kyoto that night. I knew there would be other days to do the show in Kyoto, but probably wouldn’t get back to Himeji. Unfortunately for me, because I only planned to see the castle that day, we had gotten a pretty late start and most things in the area, like the Himeji zoo next to the castle, all closed around 5:00 p.m. Even though things were all closing up by time we finished the castle tour, I decided to take a stroll through the side shopping promenades that I had seen on the way to the castle. 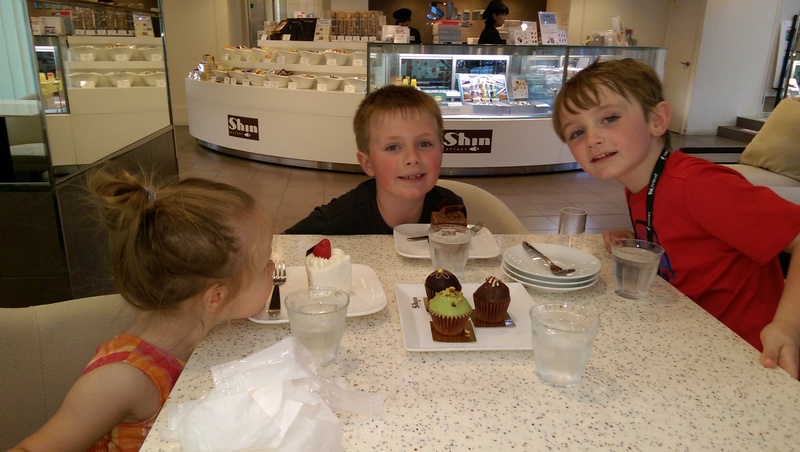 We looked at a few shops and then came across a cupcake and pastry shop. I had to go in and we splurged a little before dinner. Japanese interpretations of French and American desserts. P.S. Their version of Strawberry Short Cake is better! As we made it back to the train station I tried to think what we could do with the rest of our evening. I checked in at the JR ticket counter about Kobe. It wasn’t a place I thought I’d make it to this trip but as I looked through my booklet for the Hyogo area (which Himeji is apart of) and it talked a bit about the Haborland of Kobe and a Ferris wheel and the Anpanman Kids Museum & Mall. It looked like a fun sight, especially at night and I had read about an all you can eat seafood buffet right on the water with a great view of the light up harbor buildings. So we hopped on a regional JR train and off we went. Once we arrived, we asked for directions to Haborland and wandered our way through the station and the huge Umie shopping mall to get to the harbor shops and restaurants that is called the Mosaic, right on the water. 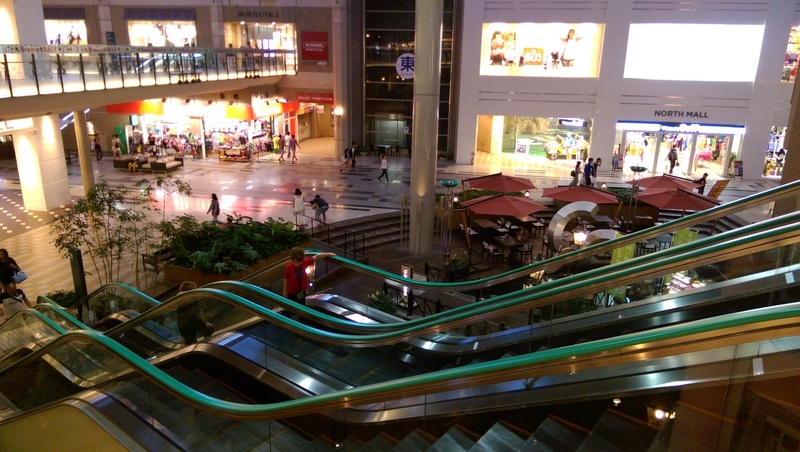 We came across and escalator that the boys begged to ride it down just to go back up. Of course I had to say yes! Cool escalator in the Umie shopping mall at Kobe’s Harborland. By chance, one of the first things we saw as we followed paths that looked like they lead to the water was the all you can eat seafood restaurant buffet called the “Fisherman’s Market.” I saw some pasta and pizza in the window and figured I’d be set for the kids. They saw us in to a table and through some patience and hand signals, we decided on how much we would be charged based on the kids’ ages, and whether or not we would eat just the food or the food buffet and the drink buffet. There was a fairly wide selection of choices but all the pasta and pizza had seafood of course. So it took a little convincing to try a few things even though they looked some what familiar to them. They also had French fries and what would be close enough to fish sticks. I made them try some new stuff and then let them have some comfort choices as well. Plus, the dessert bar with a huge chocolate fountain was a big incentive! What I liked about this place the most was that they had allergy cards at each station! So I knew which things would contain wheat. There was still a chance for gluten, but knowing which things had wheat was a big step because it also told me which things had soy sauce, which is often hard to figure out here since it is a common ingredient. In addition to the food, the view was spectacular! View from the Fisherman’s Market restaurant in the Mosaic. At Kobe’s Harborland. We knew even before dinner that we were there too lake for the kids museum, but what we really came for was the view and the Ferris wheel. And in that, we were not disappointed! 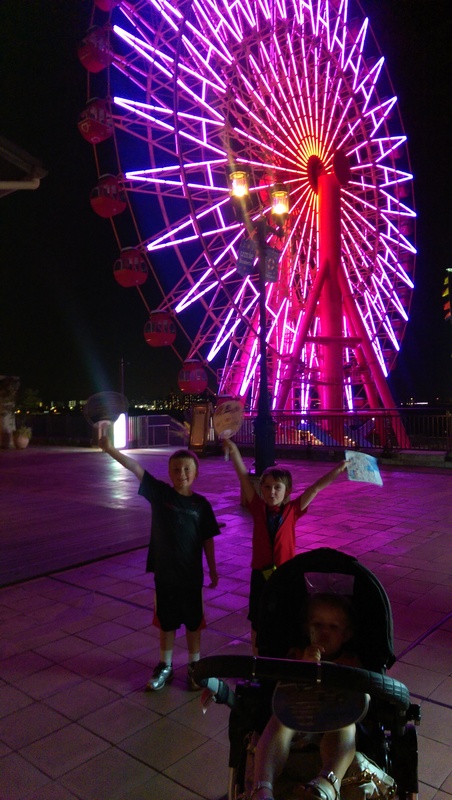 Ferris wheel at Kobe’s Harborland. In all, we had a great evening that was the perfect night cap to a fun day. Now, we just had to get back to the hotel. 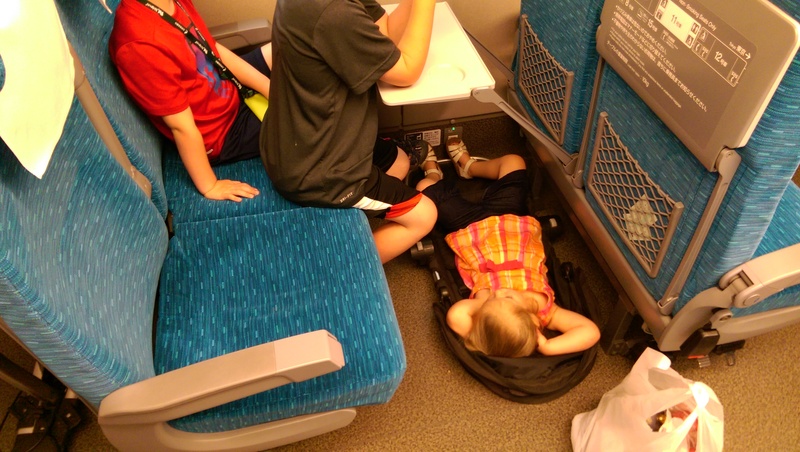 I took the risk again of having 3 sleepy children when we arrived back at Kyoto station. But I was prepared! Since I had packed my Ergo, I figured I could just put my 2 year old on my back in case my 5 year old fell asleep on the train. I could then push him in the stroller. Sure enough, my 5 year old fell asleep, but so did my 7 year old! To make matters worse, my phone froze up and was not working. I was in a bit of a panic because I can’t handle being in a foreign place without my phone, just in case. After a few failed attempts to find something I had to fit in the pin hold to pop out the sim to restart it, I asked a group of business man with my pointing and hand gestures if they had something that could fit. Thankfully one did, the pin from the back of his name badge! Good thing for me that people go to work late and come home late! At 10:00 p.m. the train was packed with business men returning home from work! 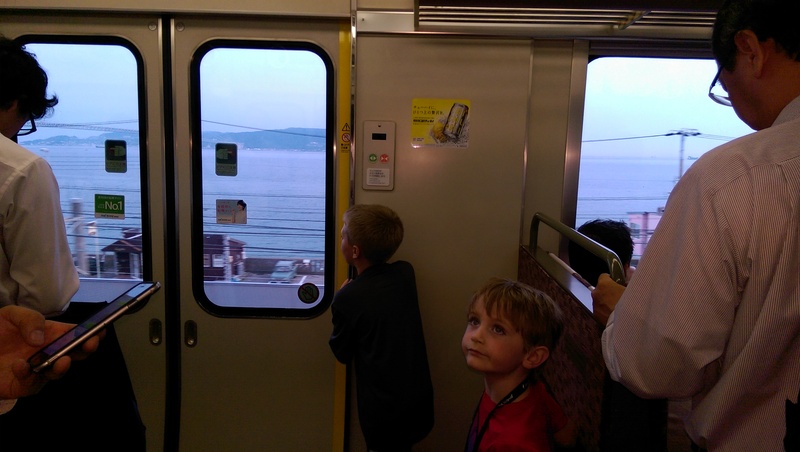 With my phone fixed, my last feat was to get all 3 kids off the train. All 3 dead asleep. I was the evening’s entertainment. Our skit was an American single white female attempting to move a sleeping toddler from the stroller bassinette position to an Ergo, followed by transforming the stroller into an upright forward facing stroller in which a sleeping 7 year old was placed, then trying to balance a sleeping 5 year old on top of said 7 year old while on a moving train, then exciting the train. There were several oohs and ahhs. From there, I had no choice but to take a taxi back to the hotel. As cheap as I am and hate paying for them, the safety of the kids still comes first and there was no way to get then onto two more subway transfers to the hotel. But we made it, and I had never been so relieved to find my way to my bed! Maximizing Your Hotel Amenities-Day 2 in Japan-Kyoto! 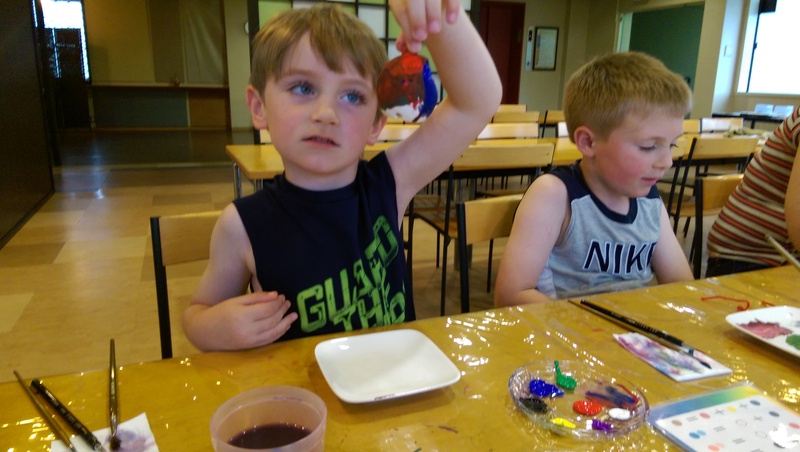 Even in a new and exciting country, kids need some down time and the chance to feel like they are actually on a vacation that includes some rest and leisure. After two full days of travel and sightseeing, I knew that this day would be the perfect day for something low key. We didn’t get to sleep in until 6am this time, the boys were wide away at 4am and I have to admit, so was I. They were all asleep by 8:30 p.m. after our long day in Tokyo and train to Kyoto. Madelyn stayed asleep until 6:30 a.m. which was a relief. Breakfast opened at the hotel at 6:30 but we spent some leisure time getting ready and showering and letting the kids play some tablet games while I caught up on some pictures and got ready for the day. Thankfully, the breakfast buffet was included with our stay so at least we knew we’d have one big meal a day that we didn’t have to pay extra for, and had enough “westernized” breakfast options to satisfy the kids. When we got to breakfast, I made everyone at lease browse the Japanese breakfast section and chose one or two items to try. My 7 year old went for some rice and a dim sum dumpling and my 5 year old tried some soup and Japanese style egg omelet. I had rice portage and soup but have to admit, I wasn’t as adventurous as I felt I should be in order to set an example of trying new things. I’m also having a bit of a hard time navigating the gluten free aspect of eating since I have celiac and a lot of things are just generally seasoned with normal soy sauce. There were no gluten free bread options but scrambled eggs and the omelet station were delicious. After everyone had a full tummy, we decided that, after reading the brochure of the hotel, we would explore what we had without having to travel anywhere. We’re staying at the Westin Miyako in Kyoto which is actually quite near the Gion district (traditional Giesha neighborhood). The hotel itself is a popular resort for the area that boasts a nature trail that is a bird sanctuary going up on a high hill behind the hotel with its own quaint shrine. 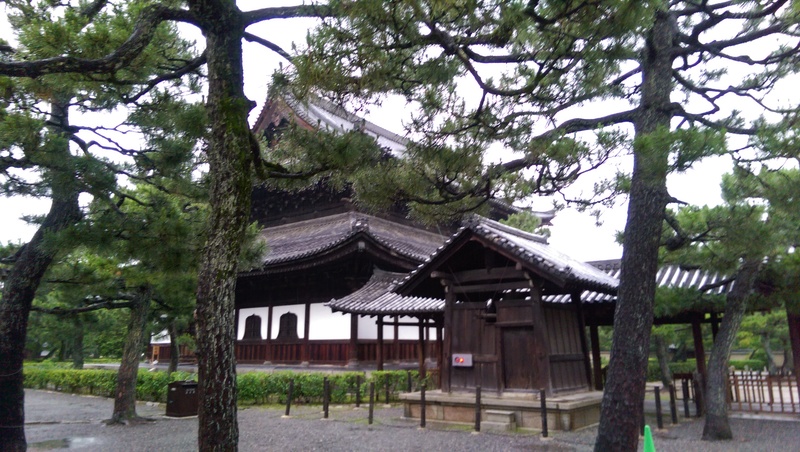 It also has a traditional Japanese Nobility home that guests can tour to see what the layout and gardens would be like. Then of course, there is a swimming pool and a kid’s room. So we decided to check that out first. 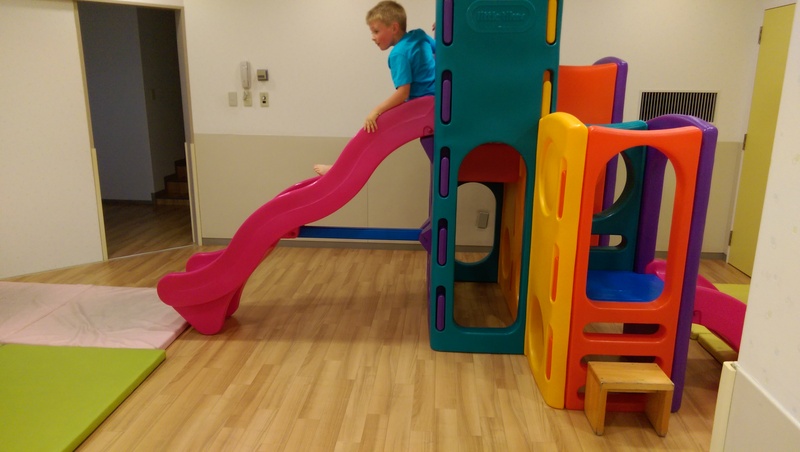 Guests can check out a key to the kids’ room for the duration of their stay. We were showed where it was at, instructed on removing our shoes and how to place them and then left to the room that had a large Little Tykes play structure, a few shelves and drawers with toys, a napping room complete with cots and a bathroom with a dishwasher and clothes washing and drying machine. Thanks to the playroom and free hotel wifi, I let the kids play for over an hour while I caught up on some writing. From there we checked out some binoculars from the front desk to take on the bird watching trail. Clearly I didn’t research this trail too much, nor had a chance to fully gage from the outside, in daylight, our natural environment otherwise I would not have ventured out in flip flops (yes I had another pair!) Immediately at the start of the trail we were presented with roughly 100 steps going straight up the side of the hill. 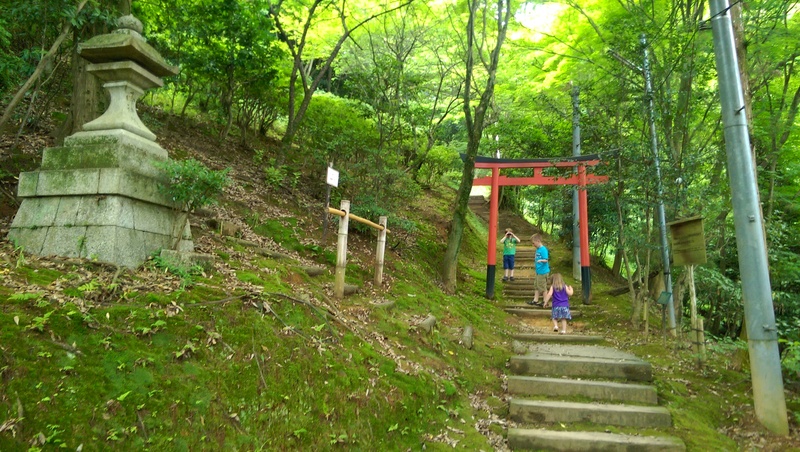 As it curved around the side of the hill there were over 200 steps total with little stops here and there for look-out points and a beautiful small shrine with a panoramic view of Kyoto below. Other than being completely devoured by mosquitos (SUPER thankful that we have the Japanese encephalitis vaccine) it was enjoyable walk that gave us a healthy dose of cardiovascular exercise. Pathway up through the bird sanctuary behind our Kyoto hotel. Traditional Japanese house of nobility. Complete with water well. Once back to the hotel, we gathered up our swimming suits with the plan to go out of the hotel in search of food and then return for a swim. With some general guidance from the concierge and a map, we set out to find something to eat. Once we got to the main road where two recommended noodle restaurants were, we quickly found that it was a bit busy for a last minute lunch rush. We decided to keep walking along to see what we could find that might have more room. Here is where I admit, I haven’t quite figured out the whole Japanese restaurant thing. Many, you can identify as being such, with a menu outside and occasionally, some pictures. But there are others that look more like homes, despite a food menu, in Japanese only, being outside. So I feel like am intruding by making an inquiry. This is one of those cultural things that I am going to just have to be brave and get over and just try. The problem, is of course the 3 kids. When we see a picture of the food, I don’t always get an agreeable response. But we’re working on it. After walking for over a mile, we came to a 7-11. This had been a quick and easy lunch stop for us the day before so I conceded and we stopped yet again for a 7-11 convenient store meal. Now, don’t think that we’re making a cultural cop out here. Japanese convenient store food is still very different from what you’d find in an American 7-11. Though you can get some of the same candies, cookies and sodas, and corndogs! “Oh thank Heaven for 7-11!” I couldn’t agree more on this trip! 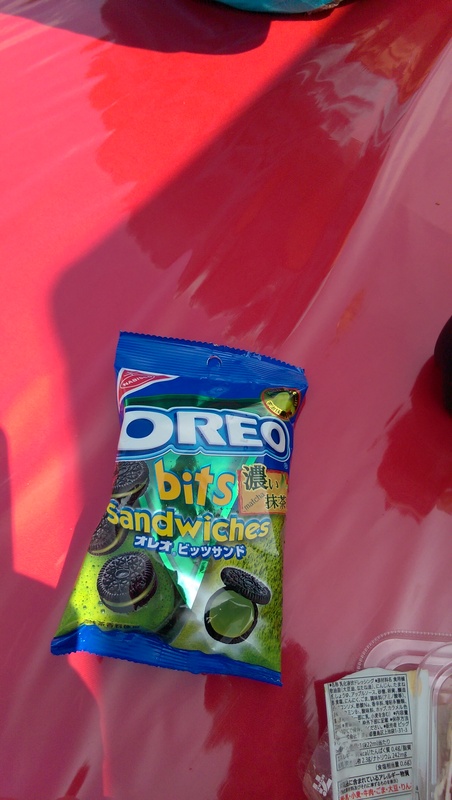 A ton of American candies and cookies have green tea flavoring in Japan. After our little picnic lunch in front of the 7-11, I saw a huge gate to a shrine. It wasn’t that far away from where we were, and wouldn’t be too far of a walk back to the hotel either. Since my 2 year old had already fallen asleep in her stroller, I convinced the boys that it would be unfair to her to go back to the hotel now and swim. 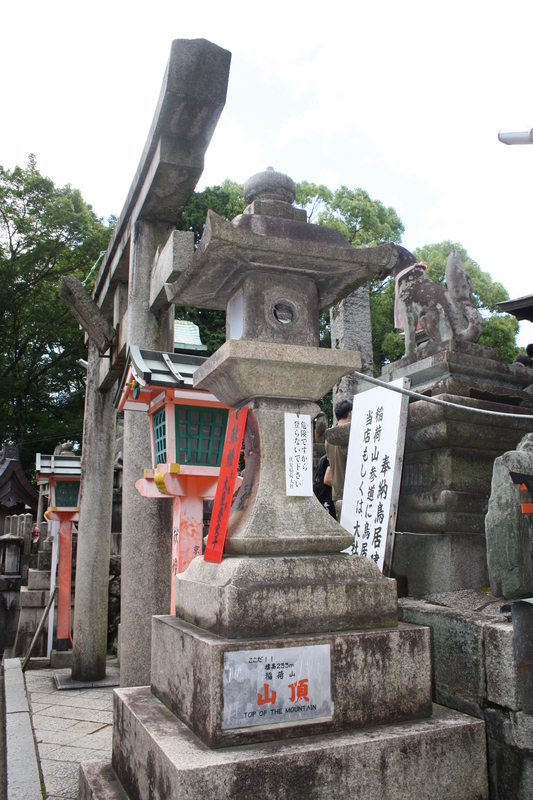 So instead, I told them we’d just go see this one shrine nearby while she slept, then we’d go back to the hotel to swim. 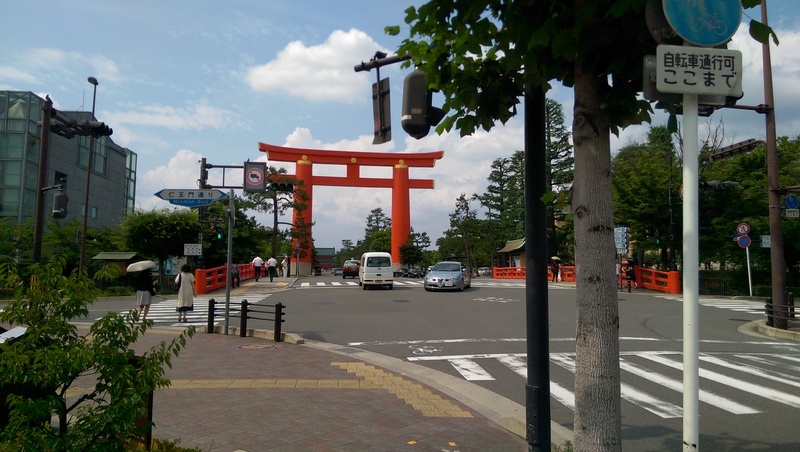 Just through the huge orange gate was the start of a park like complex consisting of a local public library, Kyoto Municipal Museum of Art and the Heian Shrine. 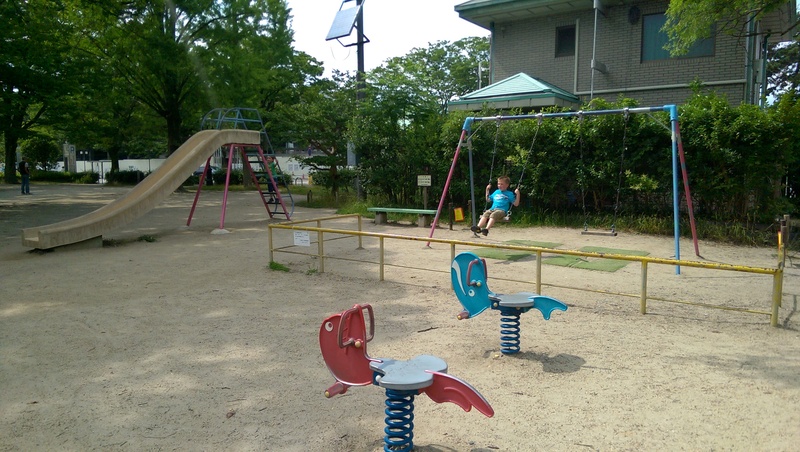 Just next to the library was a small playground that made for a nice pit stop before the shrine. 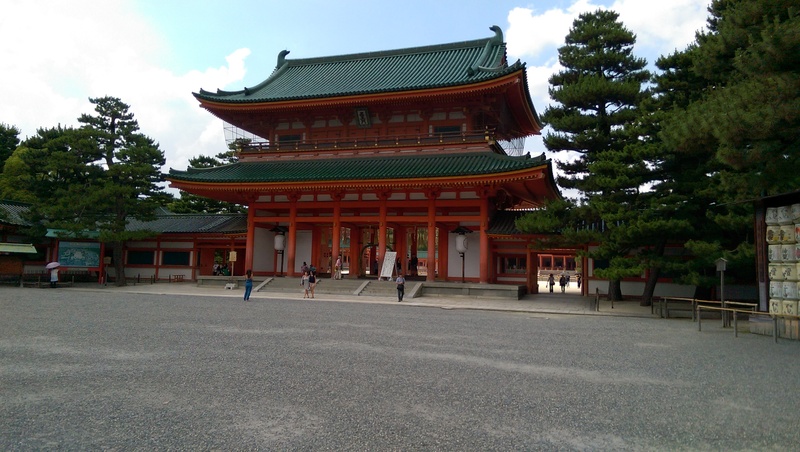 When we got up to the Heian Shrine. Once we got up to the shrine, we saw the ema wall. The ema are traditional Japanese wood tablets that you write a wish on. We had first learned about this with our Little Passports interactive games online for Japan where they kids could write and hang virtual ones. Now they had a chance to do the real thing. 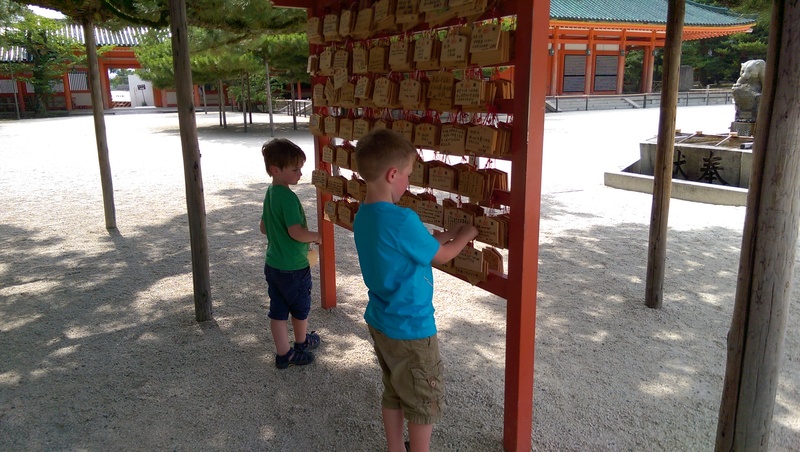 After purchasing, writing on and hanging their emas, we walked up to the main part of the shrine and did a quick loop around the grounds as the natives were getting restless. Hanging their ema, wishing tablets. 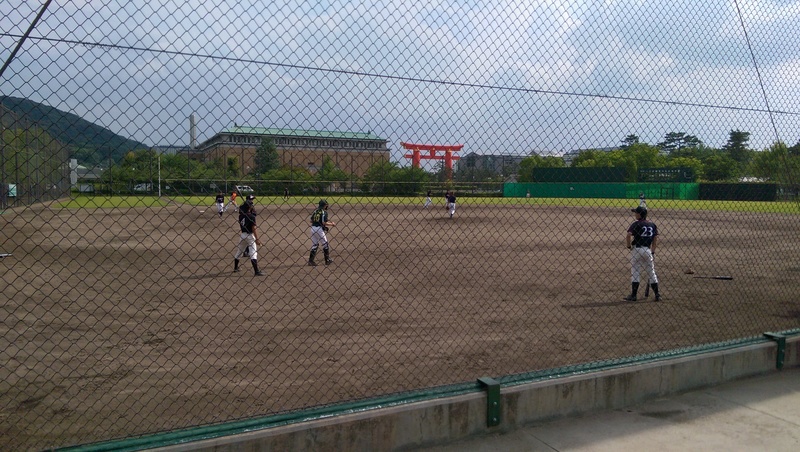 On our way back, we saw a baseball field were a baseball practice was going on. The players look at least high school age, if not college. It was fun to watch them practice and show the kids how far the “great American pastime” has spread. From the baseball field we walked past the zoo and just an average housing neighborhood. It’s important along the way in the heat we’ve been experiencing here in Japan (80+ Fahrenheit and around 29 C) to stop for water, which is frequently available in cool looking vending machines throughout the towns. 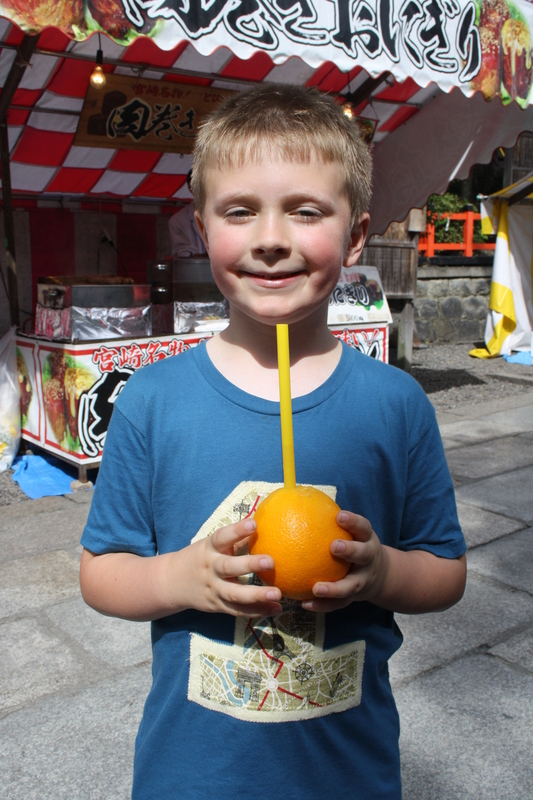 As a treat for walking back instead of getting a taxi for the last 400 meters, the kids got to choose a grape Fanta. Something not too common back in the U.S. We finally made it back to the hotel and were ready for a swim. When we checked in at the fitness center for the pool, we got the full rundown of what was needed to take a dip in the hotel pool. We knew the towels would be provided but we also received the required swim caps, a locker key for clothes and a shoe locker key. Shoes of course had to be removed in the first stage of the locker room and put in the show lockers. Then you moved into the dressing area for changing, then showered off out in the pool area then walked through a foot rinse pool in order to get to the main swimming pool. It was probably the biggest and most structured operation the kids had seen to go swimming. But none of that matter once we all got in the pool and enjoyed 2 hours of just swimming and having fun together. Exhausted from our swim, we went back to the hotel room to get freshened up and relaxed a bit before heading back out of the hotel, on their shuttle this time, to the Gion district in search of food once again. The Gion district was just a close shuttle ride from the hotel and is a huge shopping district full of traditional Japanese teahouses and restaurants. 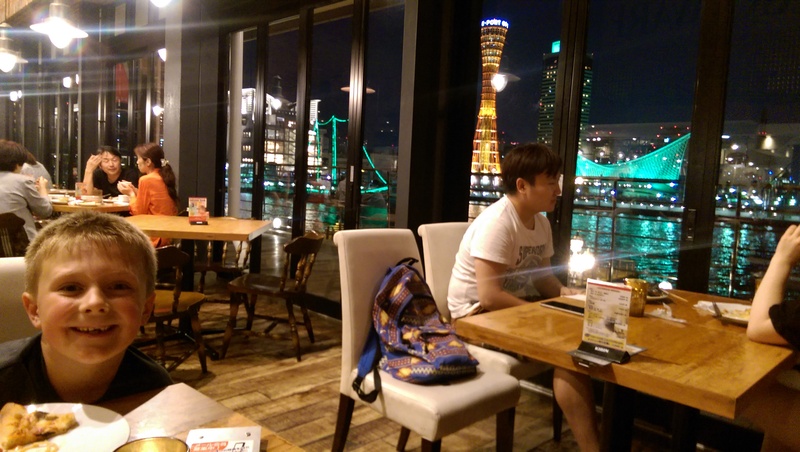 It’s close to the River as well where restaurants line the river with makeshift decks overlooking the river. Once again, the price and intimidation factor made it difficult to settle on a place to eat. After about 30 minutes of walking around, the threat of rain loomed and we came across a café with hot dogs in the window. It was settled. 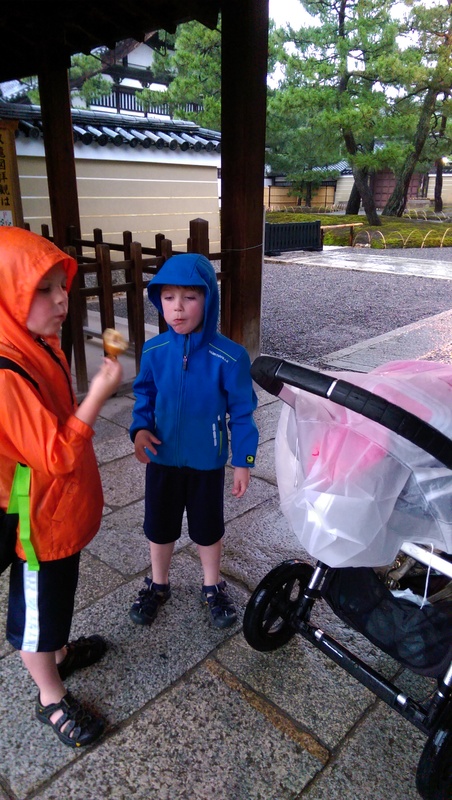 We grabbed a couple of hot dogs for the kids and then hopped a taxi back to the hotel since the shuttle would take you to Gion, but not take you back from Gion. Back at the hotel my three full and sleepy kiddos raced to get into their beds and were asleep upon their heads hitting the pillow. Which just left one more thing to do, feed myself! 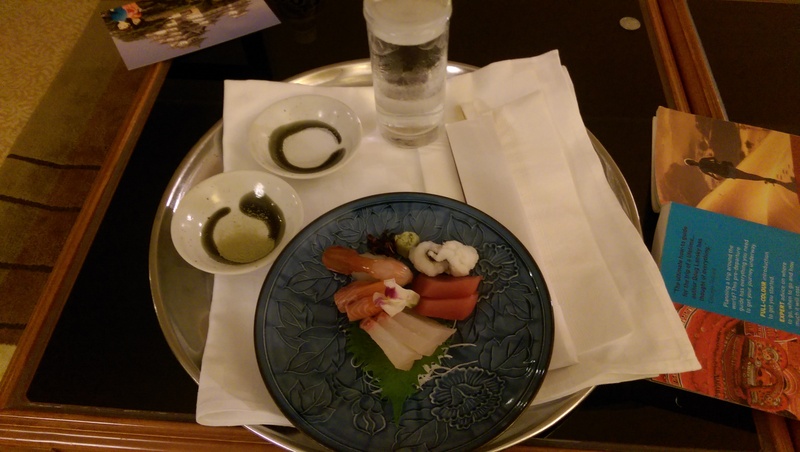 Not being able to eat the hot dogs, I decided to give into hotel room service just one time and ordered myself a plate a delisious sashimi. A perfect end to a low key day! I myself was pretty tired and found my way to bed by 10:00 p.m., knowing full well what a big day we had ahead of us! Finally some real Japanese food for mom!